Have a similar project to discuss? 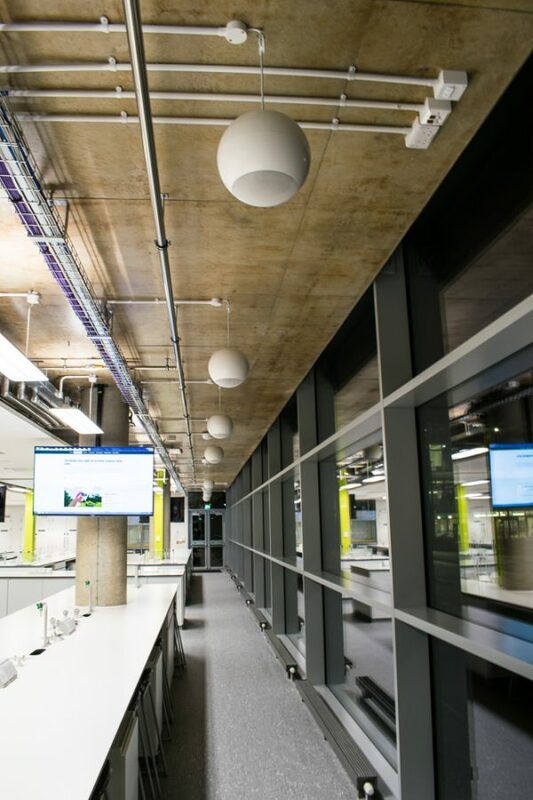 Engineering for Health Building is a new development at the Guildford campus, dedicated to teaching Biology, Biomedical and Electronic engineering. The building was established to accommodate an increase in demand for course offerings in these areas respectively, whilst taking advantage of recent funding opportunities. > Encouraging students to collaborate and learn through interactions. > Mask complexity i.e. end-users are able to use the systems without necessitating prior training. The 1st floor consists of a Foyer area with a flexible teaching area in the centre of the room, encircled by 8 person pods for groupwork. Small exhibition / information area off the foyer. 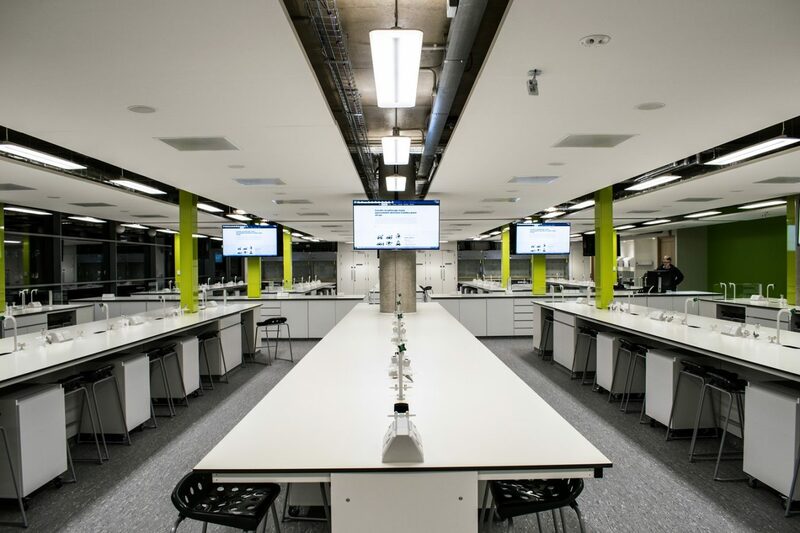 Lecturers can deliver presentations and demonstrate live experiments through the dual screen output, installed PC, 2x laptop inputs, ceiling-mounted Wolfvision Visualiser (HD 1080p video feed, controlled via IP connection to the Crestron control system and output HDMI video to the Crestron matrix switcher via 6x Crestron transmitters) from a central teaching position in the lab. Students view visual feeds on 10x Sony 55” ceiling-mounted FHD displays (via IP and RS232 and output via 10x Crestron scalers). 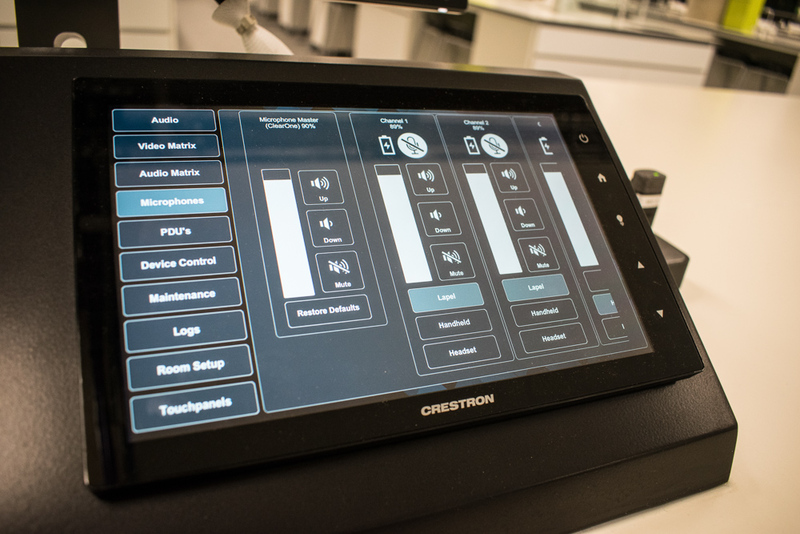 The 10” Crestron touch panel allows the user to switch on/off the whole system, display screen control, source selection, visualiser control (including zoom and focus), microphone and ceiling loudspeaker control. An additional Password-protected ‘technician’ interface allows extended features: Power distribution: to switch-off and restart each connected device individually. 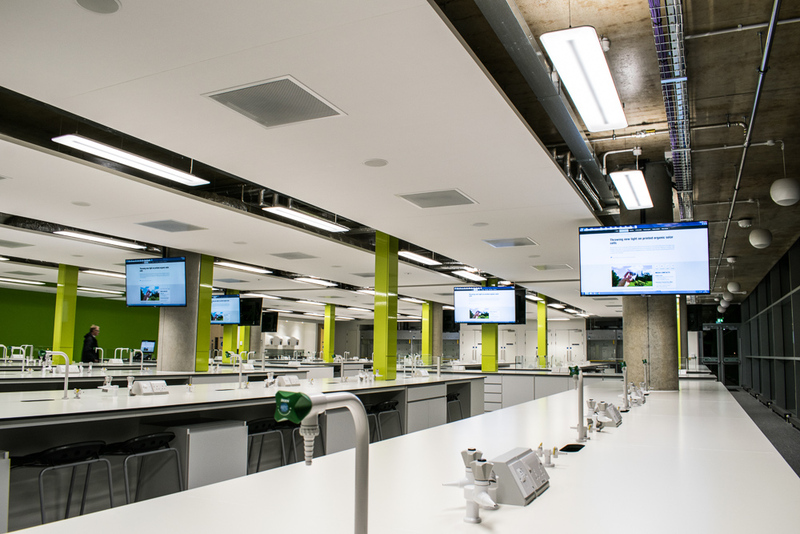 A flexible teaching area in the centre of the room has an identical setup to the 200-person laboratory i.e. 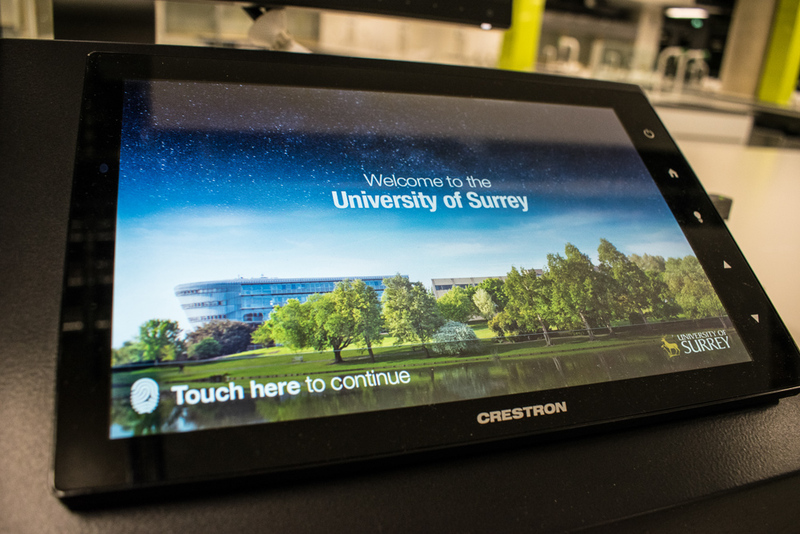 central teaching location with a 10.1” Crestron touchpanel with control of the projector, visualiser, audio control, multiple source selection and technician interface. 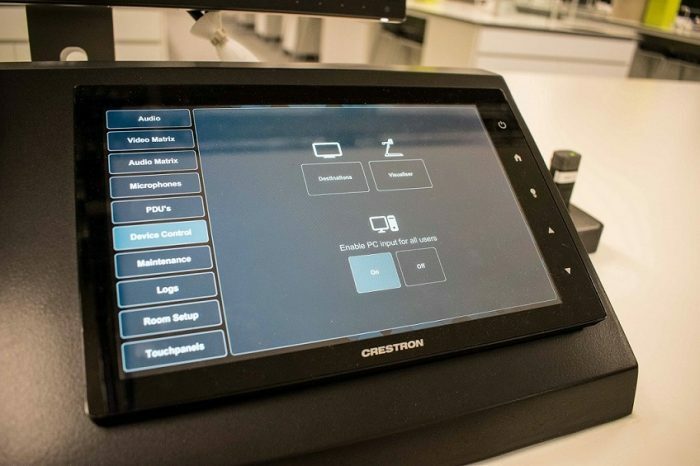 The Crestron DMPS3-200-C with Crestron DM-RMC-SCALER-C for visual, presentation control and signal routing allows switching between sources, and provide an output for the display. The matrix is part of an all-in-one controller, switcher, scaler, analogue to digital signal converter, twisted pair transmitter and amplifier with built-in professional grade audio processing. A limiter setup in both the Crestron audio DSP and functionally within the control programme, ensures sound transmission doesn’t exceed recommended level. 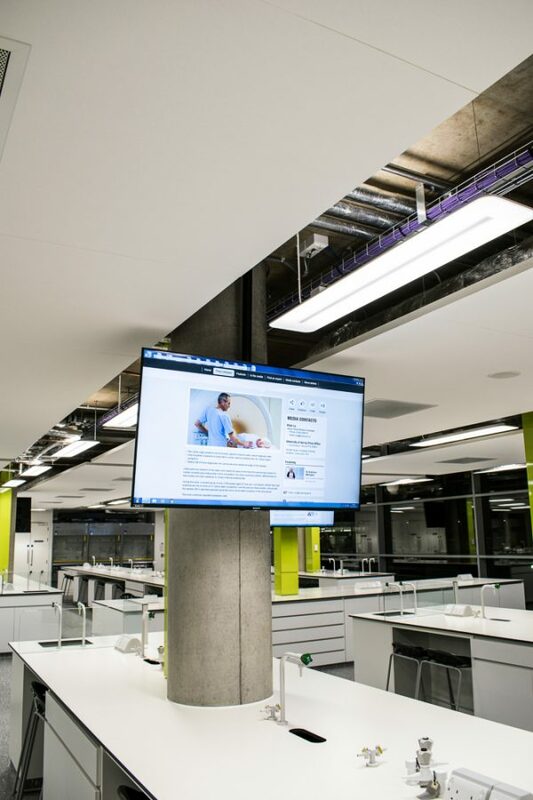 The central teaching space is encircled by 8x Break-out pods (8 seats), each with its own 55” wall mounted display screen and 4x PC inputs. Crestron TT-111-B-T cable caddy recessed into each pod desk for laptop inputs. A Crestron auto switcher unit underside of each pod table. Fire hazards are an imminent risk at a science laboratory. The building fire alarm is integrated via the I/O port on the control processor. When the fire alarm is triggered all local audio systems are muted automatically. 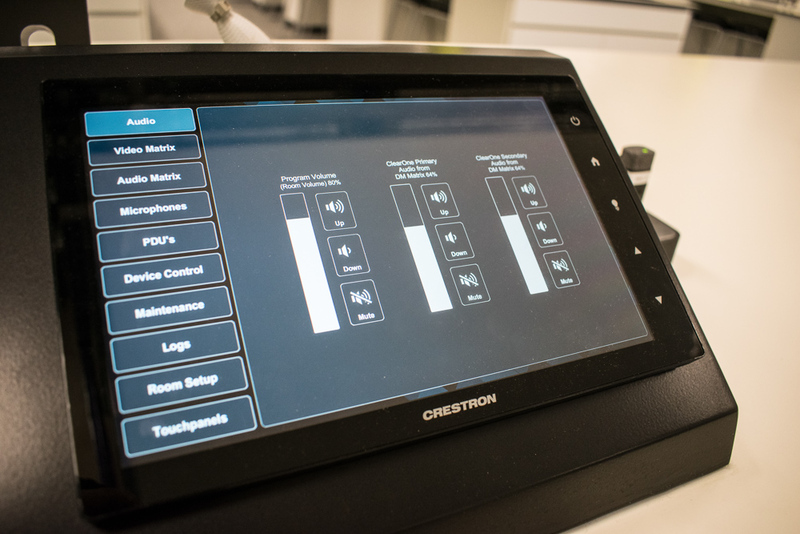 A separate Crestron RMC3 control processor at the fire alarm interface location communicates with all spaces and the central AV management system. This safety feature supports quick and efficient evacuation during an emergency.